This .38 Special ammo from CCI's Blazer series is a versatile +P load suitable for cost-effective hunting as well as target training. 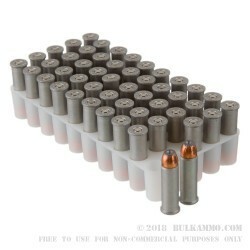 Each cartridge in this box of 50 fires a light 125 grain jacketed hollow point bullet at a muzzle velocity of 945 feet per second. This high velocity helps the hollow point produce more reliable expansion at the cost of stiffer recoil. 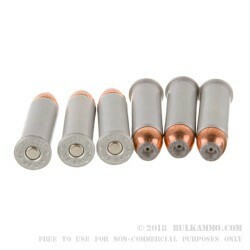 This ammo should only be used in firearms that can handle +P ammunition. 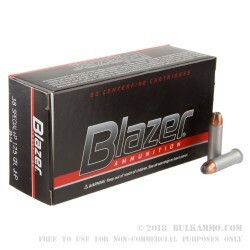 CCI Blazer ammunition is loaded in Lewiston, Idaho using non-corrosive Boxer primers and non-reloadable aluminum cases. The aluminum cases contribute significantly to the lower cost of this ammo and make it a particularly good deal for non-reloaders! I needed to get a little practice ammo for a 357 magnum revolver and after looking around settled on this. 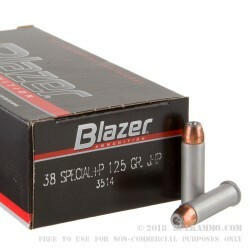 This was the least expensive 38 special ammo I could find on the internet in less than 1000 round lots. The confirmation e-mail I got from BulkAmmo said that orders received by about 2 pm central would be sent out that day. I was still shocked when the FedEx man delivered my package less than 20 hours after placing the order! The ammo was well packed and there were no ripped or dented boxes. At the range, the Blazer rounds worked fine. Muzzle flash was moderate unlike some 357 magnum rounds I've tried in the past. Recoil was mild and groups were small. I will definitely check Bulk Ammo and look for the CCI 38 special +P 125 gr JHP the next time I'm in need of something for a trip to the range.